The media in Israel ignore domestic opponents of the war in Gaza and the occupation of Palestine – but their networks are growing. Hannah Safran looks at the lay of the land on the new Israeli left. On 8 January 2009, 13 days into the war on Gaza, 45 people, Jews and Arabs, came together in Haifa to discuss how to proceed with our anti-war activities. Each one of those present in the room had already participated in more than one action against this war in Gaza. In Haifa itself, the third largest city in Israel, there have been at least two demonstrations each day – one at lunchtime at the university and the other later in the evening in downtown Haifa, where many Palestinian citizens of Israel live. At both demonstrations both Palestinians and Jews have been present. Five days earlier, on the first Saturday after the start of the war, most of us went either to Sachnin, a Palestinian town in northern Israel, to join some 25,000 people for a demonstration, or to Tel Aviv – the largest city – were there were another 10,000 people. All of the protesters were citizens of Israel, but the Israeli-Jewish press hardly mentioned the Sachnin demonstration, because it was mainly Palestinians who demonstrated. The press also hardly mentioned the Tel Aviv demonstration, because it routinely ignores the Jewish left. We all felt these protests were not enough. We wanted to bring the message home to Israelis who refuse to see that their government has engaged the country in yet another unnecessary and cruel war. Most of those in the Haifa meeting knew each other from years of protest against Israeli occupation of the occupied territories and especially from the anti-war protests during the second Lebanon war, when Haifa itself was bombarded. However, there were also new faces – young men and women who added to the sense that we are increasing in number and there is still hope. We belong to a growing public that does not buy into the Israeli propaganda of ‘there is nobody to talk with’ – the idea that we, Israelis, are eager to make peace but they, the Palestinians, are not interested. We have come of age during the past eight years of activism against all odds. Many of us are long-time, dedicated peace activists. We come from organisations such as Women in Black (a 21-year-old vigil against the occupation), the Hadash party (a coalition of left-wing groups and the Communist Party), Ta’ayush (an Arab-Jewish activist group), the Haifa University Forum Smol (left wing lecturers and students), Isha L’Isha feminist centre and many other groups, all of them working in their own way for politics of social justice and peace. We are Jewish and Palestinian Haifa residents, all citizens of Israel. But nobody in mainstream Israeli politics or even academia is ready to recognise that these alliances are the nucleus of the new left in Israel today. Even the (only) liberal daily newspaper Ha’aretz, which has claimed since the year 2000 that there is no left in Israel, refuses to recognise that something else has developed on the ruins of the old Zionist left. Haifa is not unique in its grass-roots peace activism and its ability to bring people together beyond political differences. Many groups have been active for years and their numbers have increased a hundredfold since the beginning of the second intifada in 2000. Breaking the Silence (a group of ex-servicemen who are exposing what is happening in the occupied territories), the Anarchists Against the Wall (a group of dedicated brave, mainly young people, who are at the forefront of demonstrations against the wall), the Women’s Coalition for Peace (a coalition of nine women’s organisations), New Profile (which advocates de-militarisation of Israeli society) – these are only a few of the many different groups active around the country. In addition, there are the human rights organisations that are doing an extremely important job despite the belligerent Israeli establishment. Organisations such as Physicians for Human Rights and B’Tselem have dedicated staff and volunteers who are part of the movement for peace. I should also mention the many groups of Palestinians in Israel, such as Mossawa (‘Equality’), Adalla (‘Justice’) and Women Against Violence, who campaign against war and racism and for the cultural and civil freedoms of their oppressed community. These organisations are mobilising growing numbers of young women and men who are dedicated to the struggle for civil rights, human and women’s rights for the Palestinians of Israel. One remarkable phenomenon was the declaration against the war, circulated within five days of it beginning, by 24 women’s organisations. The declaration called for an end to the bombing and demanded that war should stop being an option. The organisations signing this statement went beyond women’s peace organisations such as the Women’s Coalition for Peace. This time, for the first time, it included a mixture of organisations promoting social, legal and financial rights for women. The Haifa-based feminist organisation Isha L’Isha went even further and issued a statement calling ‘upon the government of Israel to bring about the end of the cruel siege on Gaza, to stop immediately its attacks, to free the residents of the south from their role as hostages in the hands of politics without future, and to fulfil the role for which it was elected – to bring about prosperity and economic security, peace and security, today and for generations to come, for all women and men in Israeli society, while creating true alliances with all the residents of the area’. We should recognise this change, and hope for joint action by these organisations and other civil society groups such as the environmental movement. The process that dismantled the old party system in Israel brought many people to take part in local community groups, dissatisfied with their social and political oppression. These groups have not yet been able to formulate a common platform for change, and they are facing the resistance of the hegemonic Ashkenazi (Jews of European descent) establishment, which refuses to recognise their existence and importance. But in spite of their orchestrated attempt to make the entire left-peace-resistance movement invisible, these social forces, together with the new left, might one day group together to effect change. The first group to do so was called Matzpen (‘Compass’), a group of perhaps fewer than 100 people altogether. They launched a brave struggle against the Israeli policies of expansion and oppression. Forty years later, their insight and courage is now manifested in about 60 peace groups of different kinds and a thousand people marching in the streets of Tel Aviv on the first evening of the war. It is not even just the left who oppose Israel’s policies. Even the Council for Peace and Security, a group of ex-generals and high ranking officers, had called on the government – just a month before the war on Gaza – to accept the Saudi peace plan and to go ahead with a two-state solution. And the amount of protest is growing daily. Around the world, Jews are speaking up against the myth of ‘one people, one voice’. They are fed up of supporting Israel, with its obvious refusal to follow a peaceful solution to the conflict. As I write, eight Canadian-Jewish women are invading the Israeli consulate in Toronto, chanting anti-Israel slogans. A group of Israelis who live in Holland issued a statement against the Israeli attack on Gaza. A week ago a branch of Women in Black in Melbourne, headed by an Australian Israeli woman, organised a demonstration in front of Government House and managed to get on the main news channel. The Faculty for Israeli-Palestinian Peace, based in the US, organised a petition against the bombing of the Islamic University in Gaza. At the end of the day, we have to ask ourselves whether our numbers matter at all. Every protest counts, no doubt, and the global protests are only proof of the feeling that Israeli policies are getting less and less popular around the world. However, since Israel has been at the forefront of the western notion of the ‘war on terror’, it has served a purpose that is not entirely related to the Israeli-Palestinian conflict. As long as Israel continues to fulfil the needs of US foreign policy, there is no protest movement in the world that will stop it from doing whatever its leaders feel is right. So, as much as we need to press on with our demand to stop the war against Gaza, against the Palestinian people and against the occupation, our best hope seems to lie with Obama and the promised change in the US. That may not be a very optimistic vision for our struggle. However, we, the resistance movement in Israel, will continue our struggle against the war in Gaza and the racism that prevails within Israeli society. We will continue to grow, we will connect to other social and environmental protest groups, and we will hopefully help change our society for the better. 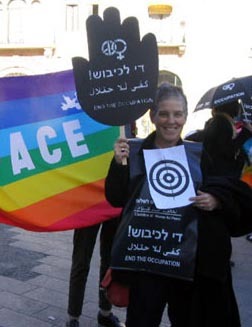 Dr. Hannah Safran is a feminist peace activist and co-founder of Women in Black, Haifa, and the Coalition of Women for Peace.